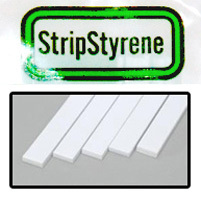 Evergreen - White Styrene Strips .080 X .250 Discounts Apply ! EVG169 - Evergreen White Styrene Strips .080 X .250 or 1/4. You can build clean, accurate models using Evergreen Styrene Plastic strips. 7 per package.